Use TB2KG5C to reference this item. This coin wants to fly to caches and to share the joy of his unique ICON to as many as possible during his resting between flights. PLEASE don't keep this coin as it is meant to travel. KEEP IT MOVING! 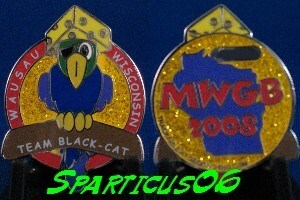 Barthalomew is a MWGB Team Black-Cat Parrot geocoin.. He is part of a Pay It Forward movement. Grabbed this one while out caching with MeowMeerkat. Dropped a Geocoin in exchange.. Liked the design on this one. I saw a lot of birds today, but only this one came home with me.